The Delaware Watershed Advisory Committee allows for collaboration on watershed efforts that benefit both water quality and the watershed communities. 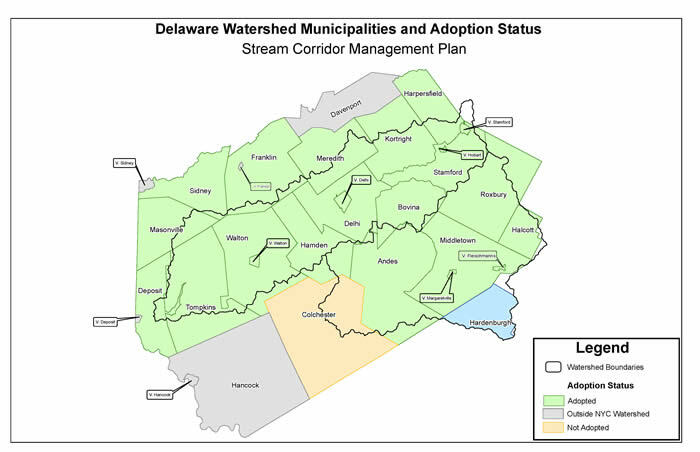 Watershed towns within Delaware County have adopted Stream Management Plans and Stream Stewardship Principles, signed Memoranda of Understanding with the Delaware County Soil & Water Conservation District and have assigned representatives to the Delaware Watershed Advisory Committee. Guided by stream stewardship principles, the Delaware Watershed Program offers assistance to local communities, residents, and organizations to advance recommendations from Delaware Basin Stream Management Plans. Stream Management Plans have been written for the East Branch Delaware River and West Branch Delaware River. To learn more about what adoption of a stream management plan entails, please click here. We also have a sample of a memorandum of understanding between a town and the Delaware County Soil and Water Conservation District to illustrate how a town could move forward with plan implementation. Finally, the Delaware Watershed Advisory Committee, DCSWCD and NYCDEP utilize an annual action plan to organize their workload and priorities. * We celebrate the role streams play in the natural heritage of our communities. Who is eligible for assistance from the Stream Management Implementation Program? Local municipality that has adopted the respective SCMP or a 501c-3 Not For Profit Corporation with a letter of support from a host municipality that has adopted the respective SCMP. Projects that are located within the East or West Delaware Basin, fall within a municipality that has adopted the appropriate stream management plan, follow the Stream Stewardship Principles and are consistent with the Stream Management Plans. * Flood Management: development of flood management planning and response plans; flood recovery assistance; flood management training, including National Flood Insurance Program training. * Highway Infrastructure Improvement: upgrade undersized culverts; potential cost-share to properly size bridges to avoid channel constriction; potential cost-share to re-align streams upstream/downstream of bridges and culverts; incorporate vegetation into road embankments; utility crossing management; floodplain management of public lands. * Stormwater Implementation and/or Critical Area Seeding: hydro-seeding of open ditches etc. ; implementation of stormwater techniques to retain and/or infiltrate stormwater into ground; wetland enhancement; filter strips; creation of rain garden and/or bioswales. * Recreation-Based Opportunities or Habitat Enhancements: stream access improvements; increasing navigability; development of watershed recreation plans; streamside amenities open to public; public fishing related projects; fisheries improvements and/or habitat enhancements (instream and in floodplain). * General Restoration Projects: any project not covered in the above categories. Such projects may include a gamut of projects from passive restoration to full-scale restoration projects that would provide multi-faceted benefits to a local community. * Education/Outreach/Training: workshops; newsletters; public meetings; school programs; stream clean-ups; volunteer plantings; educational kiosks; outreach materials; training programs/opportunities; stream celebration. * Planning and Assessment: floodplain management; coordinated flood response; technical assistance; land use/open space planning and/or incorporating stream management into economic development initiatives; creating/enhancing local control through environmental policies; collaborating at the county, regional and local levels supporting watershed communities. Have a project or program idea? Click on the link below for an application packet for funding under the program or project track. Download the file to your computer and then fill in the form. Adobe Acrobat Reader is required. The Project Advisory Committee (PAC) was formed to help empower local communities to take ownership of stream management on the local level. PAC role is to be a leadership in the SCMP implementation of the recommendations, identify local needs, and work with the communities and resource agencies toward solutions and project implementation. The PAC assists the Stream Corridor Management Program Team in the further development and implementation of the Biennial Action Plans, review and scores on the Delaware Watershed Stream Management Grant Program, and is a liaison with watershed stakeholders. Members also serve on one of the four Sub-committees: Fisheries and Habitat, Flood Issues, Highway and Infrastructure and Education and Outreach. Click here for the membership of the Delaware Basin PAC and Subcommittees.